Using a sharp knife, cut the feta into eight even chunks. Place into a bowl with the mint sauce and mix, without breaking up the cheese, until evenly coated. Set aside for 10 minutes to marinate. Cut the lettuce, cucumber and tomatoes into 2-3cm chunks. 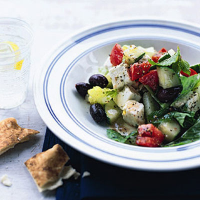 Place in a bowl with the olives, fresh mint and dressing and toss to combine. Warm a non-stick frying pan over a medium to low heat. Add the feta and cook gently for about 2 minutes. Turn each cube over with a palette knife and cook for a further 2 minutes, or until hot and softened but not coloured. Spoon the salad onto serving plates and top with the hot feta. Serve immediately with warmed pitta bread.